Exeter Harriers’ athletes produced a good start to their cross country season with a team of 28 making the journey down to Plymouth for a Brooks Westward Cross Country League fixture. With good underfoot conditions, times were very quick and the competition in all the races was very competitive. Jasmine Wellman marked her debut in the league with an outstanding performance over the 2470 metres distance to comfortably win the under 13 girls race. Runa Manby backed her up well in 6th place in 10.08 with Brooke Coldwell 16th in 10.35, Katelyn Wells 20th in 11.05 and Courtenay Howard 25th in 11.35. The under 15 boys trio of Finley Mclear, Owen Coldwell and Elliot Moran all finished in the top 5 in their race over 3170 metres to easily win the team prize. Finley finished 2nd in 10.42, Owen Coldwell 3rd in 10.53 and Elliot completing the top 5 in 5th with 11.17. A number of the under 11 boys athletes were marking their debut in the league with good performances with debutant Sam Mills finishing 4th in 5.50, Cameron Bryson 10th in 6.07 and Louise Chamberlain 18th in 6.29. 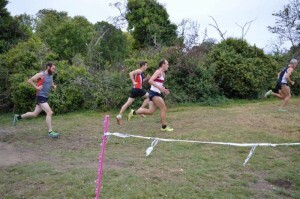 A large number of senior men turned up for a hotly contested race with many of the best athletes from Devon and Cornwall appearing. James Denne was first home for the club in 9th place in 30.10 followed shortly after by Ollie Berry in 21st in a time of 31.33. Next home was Mark Smerdon 43rd in 33.09, James McClaren 44th in 33.13, Matt Dowell 46th in 33.15, Howard Bailey 53rd in 33.49, Adam Stobbs 62nd in 34.29, Peter Chamberlain 85th in 37.19, Alan Cattell 144th in 42.32 and Jim Zaple 150th in 43.44. In a big field of over 170 athletes for the senior / under 17 womens race Katie Olding ran very well against athletes a lot older than her to finish 13th overall (5th in her age group) in 24.18. Madeleine Roche was next home in 48th place (10th in her age group) in 27.30. In the under 17 mens race Joe Chamberlain was first home for the club in 7th place in 22.15 with Alfie Devine-Wright just behind in 8th place in 22.34. In the under 15 girls race Anna Downs finished in 8th place in 12.59 with Sophie Burden 25th in 15.23. Meanwhile in the under 13 boys race Craig Moncur was the sole entrant from the club and finished 13th in 9.57. This was a steady start for the club and we will be looking to improve come the next fixture on the 9th November at Newquay.